We recently contracted with K-Designers for a master bathroom remodel. K-Designers completed the work on June 26, 2014 and we couldn't be more pleased. When we bought our home in 2011, there were some items on my wish list that I compromised on. The master bathroom was one of those items. Since our home was built in 1962, the master bathroom (shown below) did not include the modern day luxuries like a bathtub to relax in after a stressful day at work. 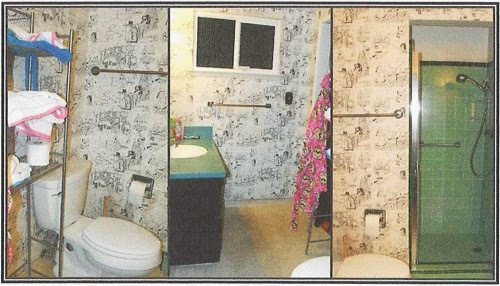 Let's not even mention the quirky coloring book wallpaper with outhouses galore (or my monkey bathrobe)! I thought that a bathroom remodel would be out of reach for a very long time. Of course, that didn't stop me from signing up for a free in-home estimate at the Sacramento County Fair. What I thought might be a huge waste of time turned out to be the beginning of a great experience. Tom Lynch, a K-Designers Marketing Director, inspected our bathroom and gave us a very thorough presentation. It wasn't just a sales pitch. It was an introduction to the company and their "it's all about the homeowner" attitude. Tom was courteous and professional and made us an offer we couldn't refuse. I was finally going to get my soaking tub! Our installer, John Mello, was the icing on the cake. He was friendly, professional, and a perfectionist when it came to his workmanship (and this was no easy job)! 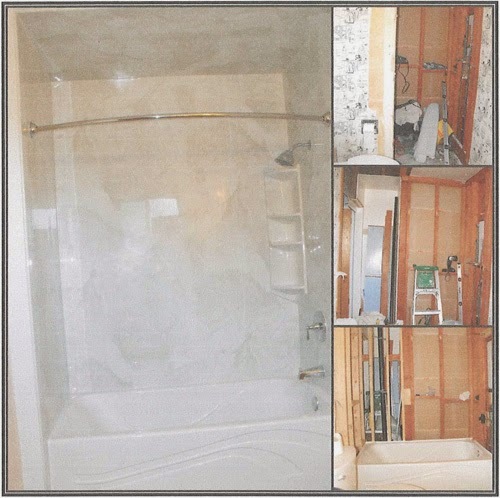 John converted our teeny tiny shower stall from the 1960's into a beautifully updated soaking tub and shower combo. In order to do this John had to tear out, rebuild, and re-frame the wall. 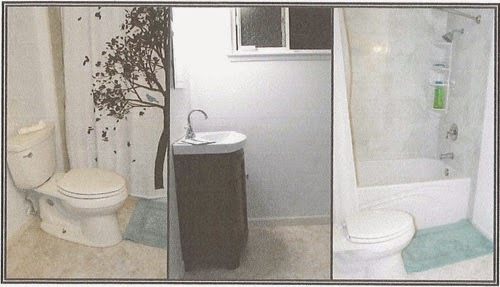 It looks like a completely different bathroom! In order to make room for the new tub we had to make a tough sacrifice. One of the bedroom closets (my husband's closet of course) had to be downsized. 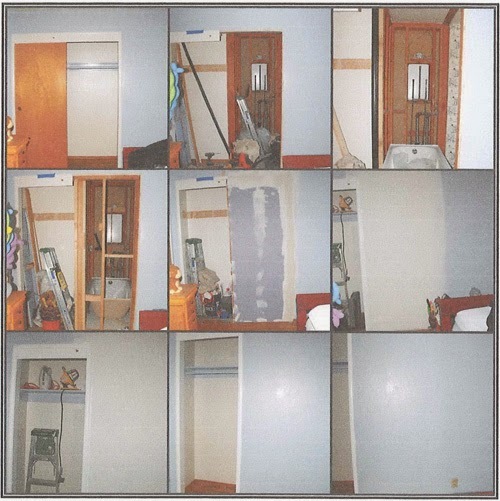 So, in addition to re-framing the bathroom walls, John had to reframe the closet and bedroom wall. John did a great job on the wall. It is a perfect match and it looks as if it has always been this way! After deciding to convert the shower, my husband and I thought it would be a good idea to tear down the wallpaper, replace the vanity/sink, and get rid of the nasty linoleum floor. We figured it would be simple enough and we could save a little money. In hindsight, we should have saved ourselves the headache and had K-Designers do the work. If we had, the work would have been done sooner (and with John doing the work it would have been done perfectly). Even though K-Designers wasn't contracted to do the work, John gave us helpful tips for the do-it-yourself portion of the bathroom. He even helped us with the underlayment for the new vinyl floor. Now, instead of living with the master bathroom that I settled for, I can finally say that I have a bathroom that I love! Thanks K-Designers and a special thanks to John!